* an unapproved spring trap (e.g. a gin trap which is a form of spring trap with toothed jaws, banned in 1958). * an approved trap in unapproved circumstances (e.g. a Fenn trap placed on a pole to catch birds of prey). * to sell, offer for sale or possess any spring trap for such an unlawful purpose. 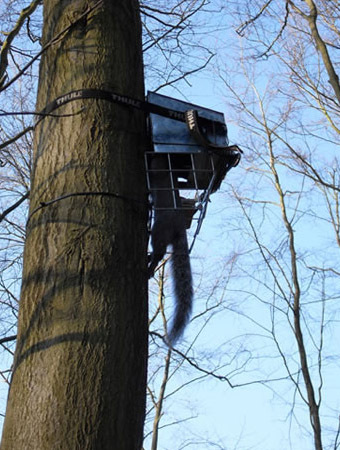 Section 8 does not apply to break-back traps designed and used to catch small mammals (e.g. rats and mice) or the type commonly used for taking moles in their runs as these are made an exception under the Small Ground Vermin Traps Order 1958. * where spring traps are used, they should be inspected at reasonable intervals and at least once every day between sunrise and sunset. Failure to do so is an offence. Domestic cats and dogs can be classed as property under the Theft and Criminal Damage Acts or equivalent legislation in Scotland and consequently it could be an offence to set traps intentionally or recklessly to kill or injure these or other domestic animals. The domestic cat and feral cat are one and the same animal - Felis catus. The family pet is classed as the personal property of its owner and any unjustified control may lead to prosecution. Although the cat's owner cannot be held liable for its actions, they could sue for damages should their cat come to any harm or go missing. Feral cats are prolific killers of nesting birds. If it can be shown that they have bred or are living in the wild then they may be humanely dispatched. Non poisonous bait can be used in traps, but if, through being placed near an adjoining field, it attracts domestic animals which would not otherwise have been likely to have entered the land, and those animals are injured or destroyed, then the person setting the trap could be liable to pay compensation and possibly prosecuted under the Criminal Damage Act 1971.